Ice dams form when the surface of your roof is significantly warmer than the ambient temperature. This is often caused by a poorly insulated attic that allows warm interior air to heat the bottom side of the roof. When snow falls on a warm roof, it melts and flows down to the roof edge. As it reaches the cold roof eaves, the water refreezes and creates a dam that blocks the path of snowmelt. Any water trapped behind the dam can make its way under your shingles and into the roof. The key to preventing ice dams is to keep the roof surface from getting too warm. You can stop ice dams from forming with the help of proper attic insulation and ventilation, both of which keep the surface of the roof cold and prevent snow from melting. But as many homeowners have experienced, sometimes attic insulation and ventilation aren’t enough to keep ice from forming along the roof line. In these cases, Gutter Helmet® and Helmet Heat® are the solution you need. 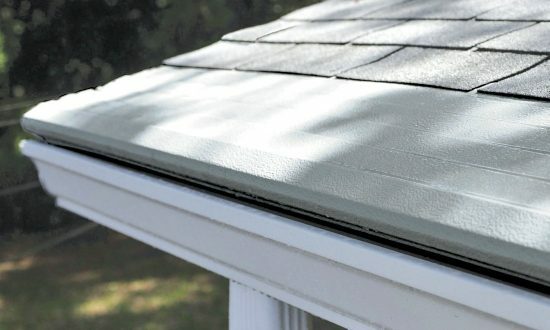 Gutter Helmet®.Our best-selling gutter protection system helps prevent ice dams by keeping your gutters clear of obstructions through the worst kinds of weather. Clean gutters offer a path for snowmelt to move away from your roof and home, rather than allowing it to back up and refreeze. Helmet Heat®. Our energy-efficient, self-regulating gutter heating system melts snow and ice before they get a chance to build up on your eaves. The snowmelt then flows harmlessly through your gutters and downspouts. Helmet Heat cables are installed under Gutter Helmet gutter covers, ensuring a clean look as well as an effective ice dam-busting system. Together, Gutter Helmet and Helmet Heat are your #1 defense in the battle against ice dams. The best part: you can enjoy year-round peace of mind without ever having to get on a ladder! For all your gutter protection and ice reduction needs, get in touch with your local Gutter Helmet dealer today. You can also call (800) 824-3772 or fill out our contact form to schedule a free in-home appointment with one of our sales representatives.